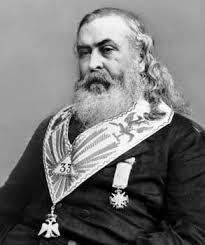 Today in Masonic History Albert Pike is born in 1809. Albert Pike was an American solider, attorney and writer. Pike was born in Boston, Massachusetts. Attending school in Newbury and Framingham until he was 15. Pike took entrance exams and was accepted to Harvard University. When Harvard requested the first two years of tuition, Pike decided not to attend. Pike began a self-education program and would become a school teacher in Massachusetts. In 1831 Pike headed west and would travel a route that would take him through St. Louis, Missouri to Taos, New Mexico. Life in New Mexico was not what Pike had wanted so he returned East to Arkansas. The round trip took him 1300 miles and nearly half of that was on foot when he lost his horse. On arriving in Arkansas Pike taught school in Little Rock. He also wrote for the Arkansas Advocate, a local newspaper. He wrote under the pen name "Casca". Most of his writings were in support of the Whig Party. By 1835 Pike had gone from a staff writer to the full owner of the Advocate. Pike used the paper to fully promote the Whig party in an already politically divided Arkansas. By 1837 Pike had sold the Advocate and began studying law. Pike was the first recorder for the Arkansas Supreme Court and wrote a book, anonymously, called The Arkansas Form Book which was a guide for attorneys in Arkansas. When the Mexican-American War started, Pike enlisted in the Arkansas Mounted Volunteers. He was discharged in 1847 after several disagreements with his commanding officer. It came to the point of a duel between the two men, neither of the men were wounded in the duel and after being convinced by their seconds to abandon the duel the duel was considered "inconclusive". Also in 1847 Pike became disillusioned with the Whig Party, disagreeing with the parties stance on slavery, Pike being pro-slavery. During this time Pike became a member of the Know Nothing movement. The movement was dedicated to immigration and political reform regarding Irish and German Catholic immigrants. The members of the Know Nothing movement felt that German and Irish Catholic immigrants were being controlled by the Pope in Rome and were trying to undermine republican values. (Note: "republican values" refers to republicanism not the political party) The movement was short lived and broke apart due to differences in opinion regarding slavery which further disappointed Pike. When the American Civil War broke out, Pike was on the side of the confederacy. Pike believed that state's rights superseded national law. Pike's service in the Civil War consisted largely of making contact with Native American tribes. Pike was very familiar with this since he had already established relationships with many of the local tribes prior to the outbreak of the war. In 1871 Pike published his most famous Masonic work called Morals and Dogmas of the Ancient Accepted Scottish Rite of Freemasonry. Pike was a member of Western Star Lodge No. 2 in Little Rock, Arkansas. Pike also served for 32 years as the Sovereign Grand Commander of the Ancient Accepted Scottish Rite of the Southern Masonic Jurisdiction of the United States starting in 1859. During his time as Sovereign Grand Commander, Pike devoted much of his time to re-writing the the 4th through 32nd degrees of Scottish Rite for the Southern Masonic Jurisdiction.